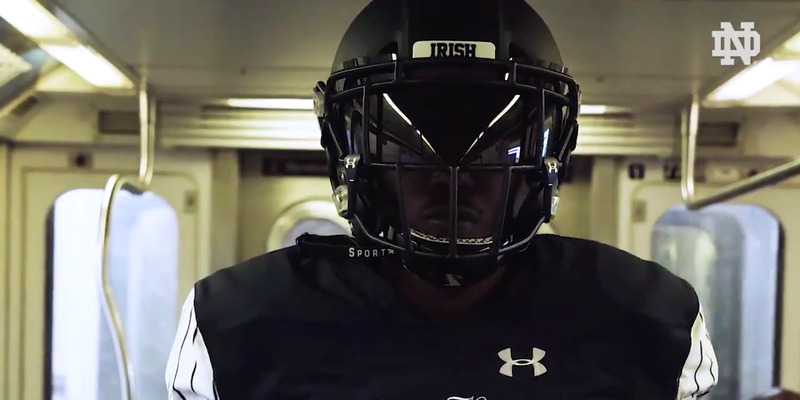 @NDFootball / TwitterNotre Dame premiered the team’s alternate jerseys for their game in Yankee Stadium, featuring some baffling design decisions. Notre Dame revealed its 2018 alternate jerseys for its “Shamrock Series” game against Syracuse at Yankee Stadium this year. The new looks have several features inspired by the Yankees, including pinstripe sleeves navy helmets rather than Notre Dame’s traditional gold. Fans across Twitter voiced their displeasure with the new kits. Notre Dame unveiled their new alternate jerseys for the team’s “Shamrock Series” game against Syracuse to be played at Yankee Stadium this season. The jerseys feature several features inspired by the Yankees, including pinstripes sleeves, and most shockingly to Notre Dame traditionalists, matte navy helmets that appear completely absent of the school’s trademark gold. You can check out the designs below. As with any sort of dramatic choice made in college jersey design, fans had immediate and strong reactions to the new look, with most fans expressing confusion and disgust with the kits. Well, it's too late, but maybe should have added a bit more ND influence to the design besides just name and logo… Maybe keep the gold helmets? Looks like a Yankee football uniform with "Notre Dame" stitched on it..
It’s not the first time that Notre Dame has gotten blowback for their alternate jerseys. Back in 2012, Notre Dame donned helmets split between navy and gold for their Shamrock Series game against Miami, and were met with similar disapproval. Notre Dame will face off against Syracuse at Yankee Stadium on November 17, giving fans the first glimpse of the new jerseys in action.